Welcome to another Friday Feels where I share what I’m “feeling” this week. Let me just state for the record this is not a throw together for a weeknight meal kind of recipe. This is a cozy all day, Saturday project, from scratch, kind of recipe. BUT it’s so worth it. Bonus it makes two 9×13 pans or three 9×9 pans. I like to make the three 9×9 pans for our family of four and freeze two of them. That way I have an easy and delicious dinner waiting for me in the freezer for a busy week. Actually this time around, I made a double batch and gave a few away and froze four pans. Or if you just want a delicious pasta sauce, I have made the sauce portion alone before and froze it in two cup bags for spaghetti nights too! One more thing if you are local and really want it to taste right, you need to go to Russo’s Italian Deli in Grand Rapids and use their sausage, cheeses and spices if you want it to be perfect. SAUCE : Brown sausage in a large sauce pot. Add onion and celery and cook until soft, 5 - 10 min. Add garlic, parsley, salt, sugar, basil, tomato paste and water. Bring to a boil, Simmer on low 2 hours, stirring occasionally. Slightly cover bottom of pans with sauce (either 2 9x13 pans or 3 9x9 pans). 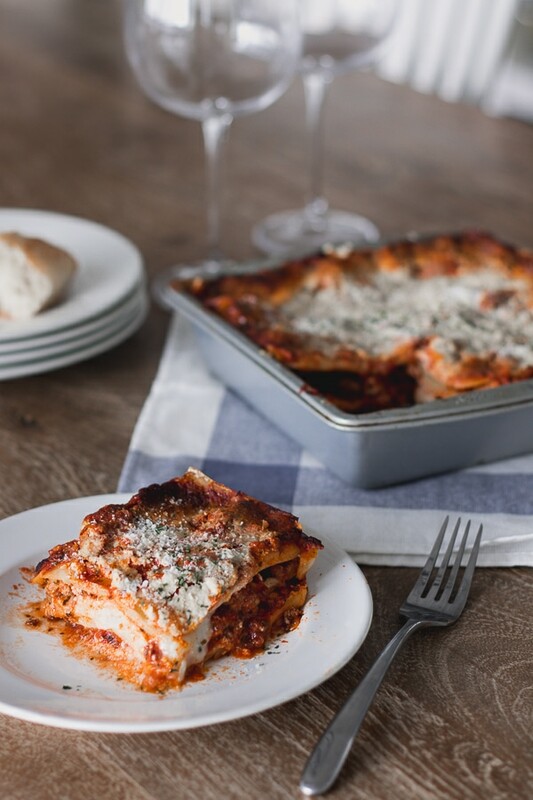 Take a slice of mozzarella and using a butter knife spread a thin layer of ricotta on each slice and cover noodles. Cover with a layer of sauce. Repeat these layers until you fill the pan. Sprinkle with parmesan and back at 325 for 45 min let rest 10 min. If you are going to freeze the pans don't add the parmesan on top before you freeze. Add it right before you bake it. If frozen bake at 325 about 75 min or until bubbling throughout. It’s been a while since I shared a recipe, but if you would like to check out a few of my other favorite’s see them here! That sounds AMAZING! I’ll definitely be trying this! *with gluten free noodles =) Thanks! Oh let me know how it is with gluten free noodles! My niece has celiac and I’ve always wondered if this would turn out ok for a family meal with GF noodles. Good to know thanks, I’ll have to try it! Perfect recipe for fall. Can’t wait to try it. Agreed! I have a few recipes that have been handed down and I love making them. I’m heading to the market now to purchase all the ingredients. I’m going to make it this weekend. Thanks for sharing, it looks amazing. My mouth was watering while looking at your photos ` please tell your family thanks for waiting! I bet it was hard ’cause it looks so delish. I will be making this one this weekend. Thank you Kelly! Haha I will! They just rolled their eyes at me as usual lol. Can’t wait to try this with gluten free noodles. I have a quick question. Do you drain the sausage after browning it? Yes you can! Sorry I should have added that in there. My sausage wasn’t very fatty this time around so I didn’t, but if you have a lot of excess grease you can drain it for sure – thanks! Kelly thank you so much for sharing!!!! I can’t wait to try it!!! It looks amazing. 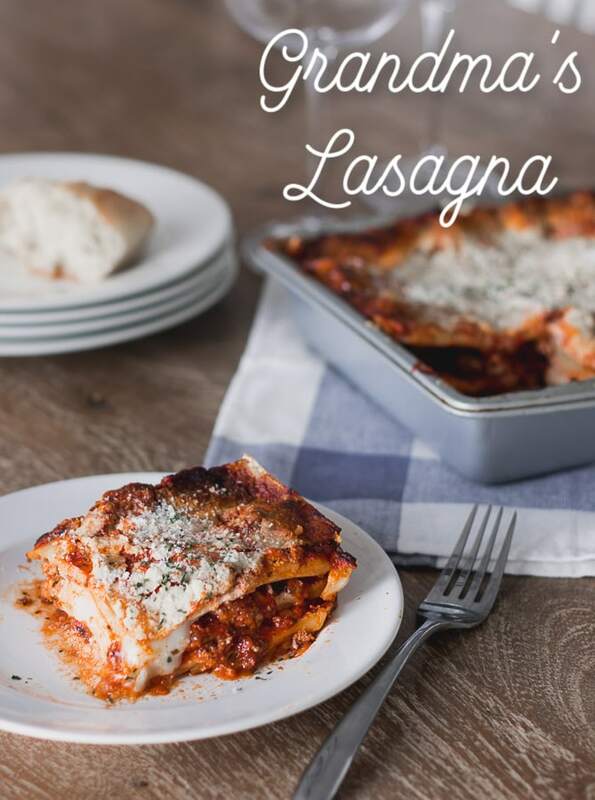 My absolute favorite version of lasagna. This recipe is a little time consuming but so worth it! 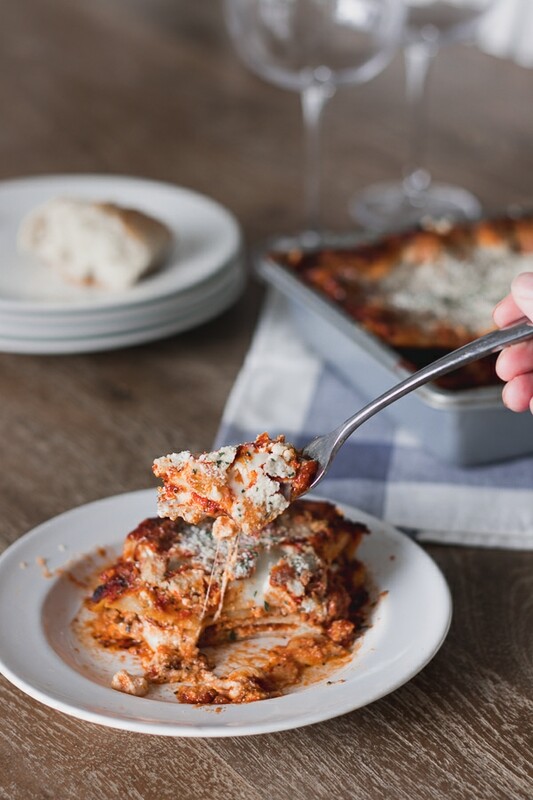 You can’t quick whip together a lasagna that tastes this good! Thank you for sharing this recipe! I made it for my family and gave away one to a friend. We all loved it and I am so happy I have one more in the freezer for another day! Oh yay! This makes my heart so happy thanks for sharing! Made this yesterday, it was delicious. Thank you for sharing! Oh yay I’m so glad you tried it! Thanks for sharing! never tried this before, thanks grace!! Hi Sharon, sorry I should have taken step by step photos because it’s kind of confusing. So I spread the ricotta on the thin slices of mozzarella. Then cover the pan with the slices, so you use as many as it takes to cover all the noodles up? Just a single layer of cheese. I hope that makes sense!